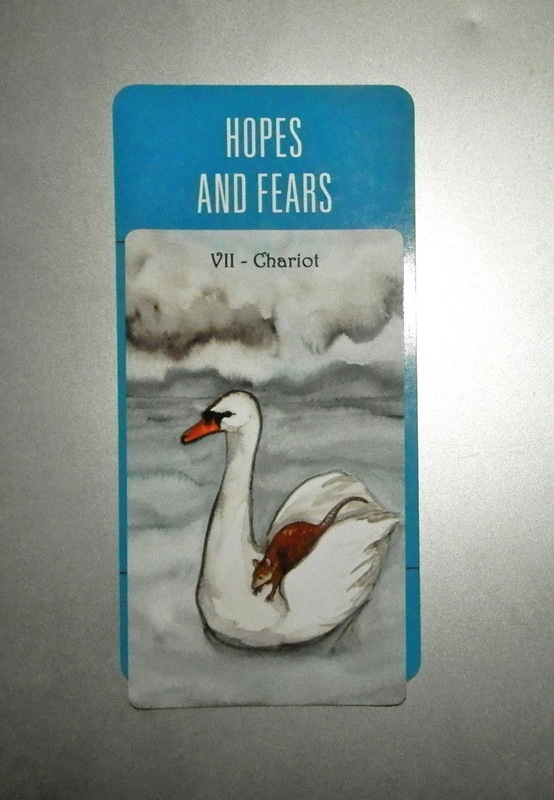 Today's Draw: Chariot from the Badger's Forest Tarot in the Hopes and Fears position from the Deck of 1000 Spreads. Do you acknowledge your personal dichotomies? Do you tend to hide certain things about yourself and promote other things? What would happen if others saw the good, bad and ugly sides of your humanity? The Chariot is a card of movement and motion. Depending on the card, I sometimes read it as being pulled in two different directions or trying to get divergent agendas moving in a single direction. It is a card of goal-directed energy, control and, sometimes, victory. As I look at this card, I imagine this rat fell in the water as the approaching storm loomed, and he found a ferry of sorts to lead him to safety. Sometimes you don't want someone else driving the bus, but you also don't have the energy or want the responsibility to drive it yourself. So it becomes a two-edged sword. Consider the swan. It's doing all the work and putting up with a rat on its back that doesn't trust it to do what it does naturally...swim. And the rat, who is usually in control of their own gig has to give control over and trust the swan because its not a good enough swimmer to survive choppy waters. Both are compromised. Both are in unfamiliar circumstances. Both are exposed to each other in a vulnerable state. But both have agreed to a goal and they move forward together. In a way, hopes and fears are like those opposing forces we must tame in order to move forward. To move forward on hope alone could prove foolish because you're not on the lookout for things that could hobble you. But if all you have is fear, you won't take that first step because there's no hope to spur you along. You need that friction between hope and fear to power your dream forward and you need to tame both so they can move forward in harmony. We're full of divergent polarities—dark and light sides, sadness and happiness, strength and weakness. There's usually one side of the dichotomy that we want to deny, preferring to be seen as the happy strong one operating on the light side. But we need both sides to produce the friction that keeps moving us forward. Being conscious and being a spiritual warrior means putting aside the ego concerns that make you want to appear to be the happy, strong, light one, and understanding the role the other side plays in your life. It means allowing others to see you as weak, sad and dark if that's where you're landing this week. On the fears side it means letting others see you as the complex, real human being you are. On the hopes side, it means being fully seen by the world and loved anyway.